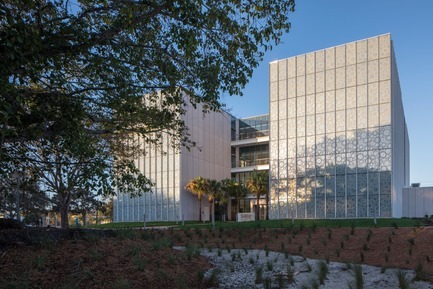 The innovative façade of Lynn Pippenger Hall, home to the University of South Florida-St. Petersburg’s Kate Tiedemann College of Business, recalls native coral in an award-winning and ecofriendly building envelope. 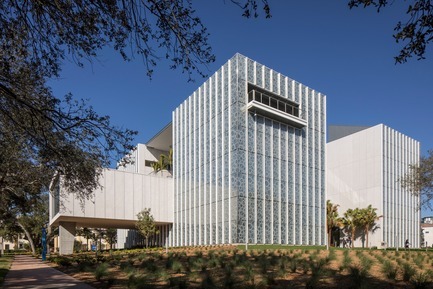 Pippenger Hall, certified LEED Gold by the U.S. Green Building Council, received accolades for its ceramic fritted façade from the A|N 2017 Best of Design Awards and has been honored by the American Institute of Architects’ Tampa Bay Chapter. 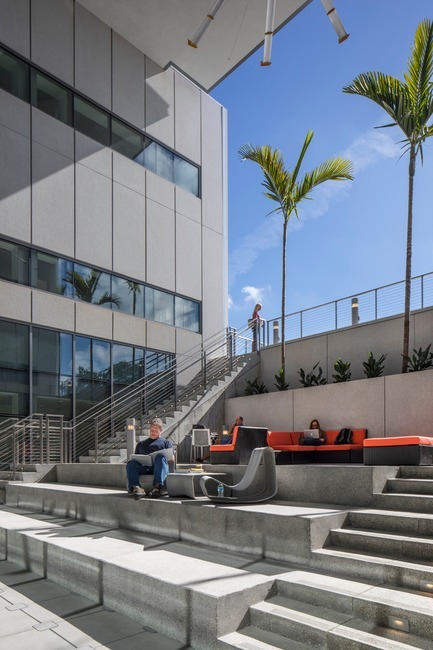 Conceived as an athenaeum for business scholars, the three-story, 68,000-square-foot building draws inspiration from its Tampa Bay setting and indigenous coral stone that lines its shores. 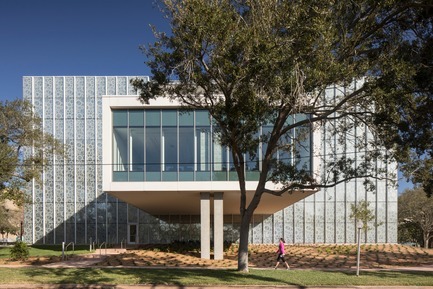 Pippenger Hall’s formal structure and glass façade metaphorically recalls the openings in coral stone, creating a porous vessel that allows sunlight and landscaping to penetrate deep within the structure’s core. 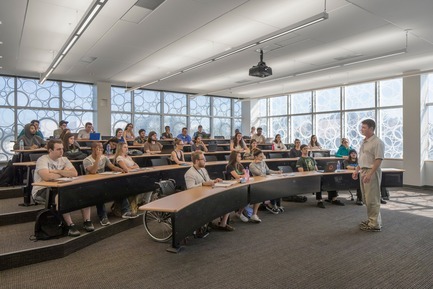 Additionally, the pocked surface of these ancient stones inspired a rich spatial interrelationship of rooms that promote collaborative learning and serendipity. 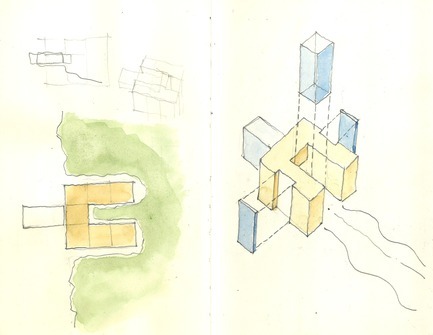 Like coral stone, portions of the building are removed to reveal voids filled with light and life. 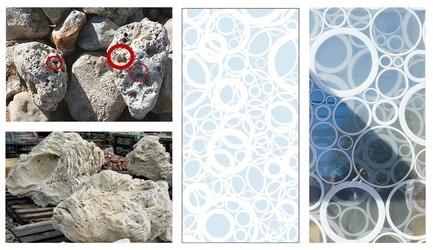 The building’s surface, like that of the stone is made up of circular openings. 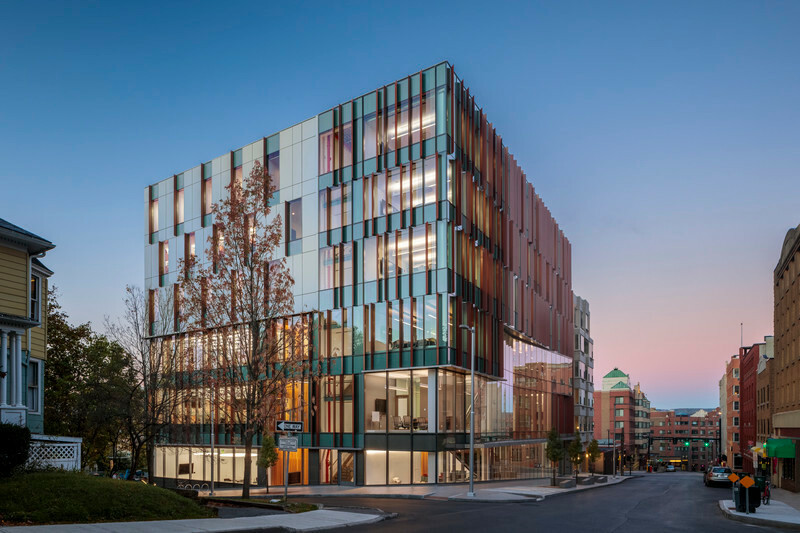 The glass façade is composed of a ceramic fritted first pane that is double run with dual-toned circular patterning and a second pane that is reflective one-way mirror glass that allows views out while reflecting the patterned ceramic coating of the first pane outward. The result is a glass surface that presents a three-dimensional quality or a shadowed depth that belies its constructive flatness. 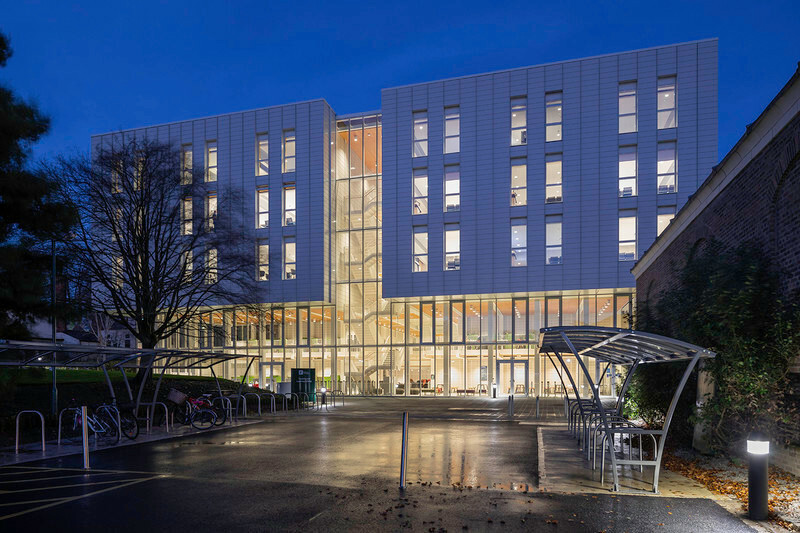 “From the simplest of regional materials is a strong compositional organization around a commons and garden and a strikingly expressive glass façade that creates a recognizable home for the College of Business that builds identity and community”, said Joseph Tattoni, FAIA, design principal. 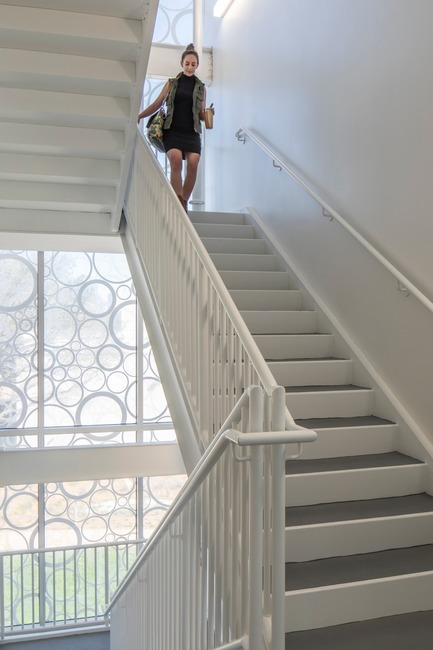 The three-story, 68,000-square-foot home for the Kate Tiedemann College of Business is designed to meet the needs of today’s business school students. 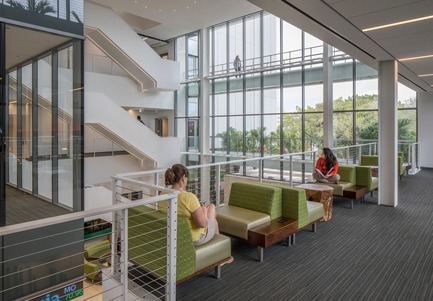 A light-filled central commons and an adjacent Scholars' Garden both support casual learning and encourage productive collisions between students and faculty as they move through the building. 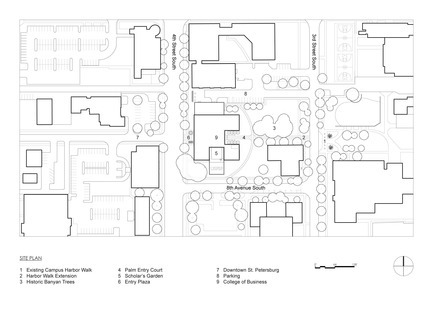 The multistory commons and scholar garden are spatially intermeshed and ringed with active learning spaces including a trading room, community room, break rooms, and classrooms. 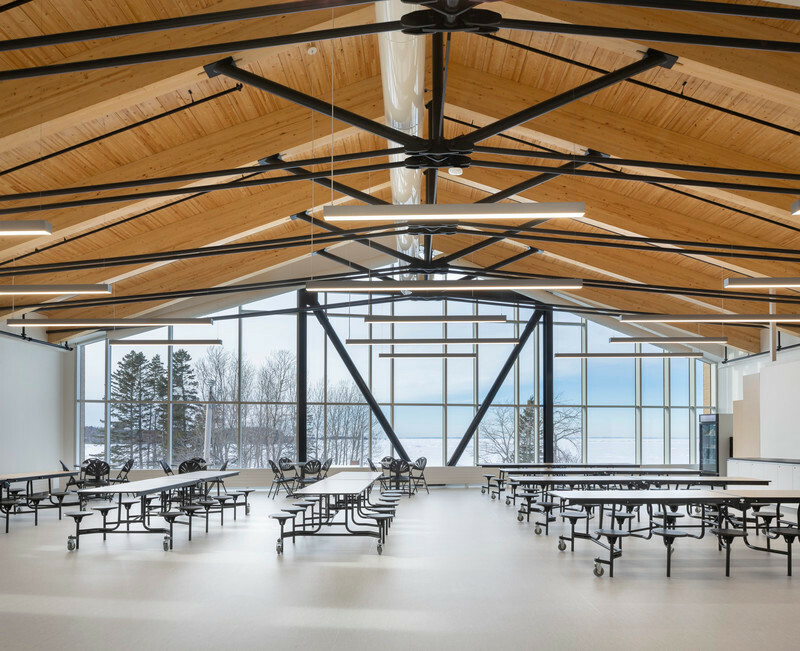 The building applies both common sense and technical approaches to sustainable design including the fabrication of furniture from live oak trees found on the site and the use of Forest Stewardship Council certified wood. 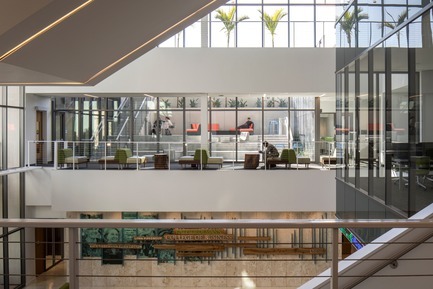 A building management system monitors energy consumption, and mechanical systems are designed to minimize energy use while providing optimal comfort control and air quality and water efficiency. 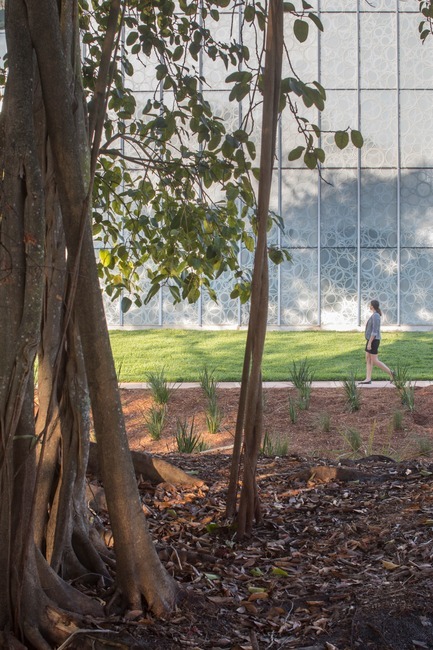 An enclosed sun-lit Scholars’ Garden brings natural daylight into the center of the building. 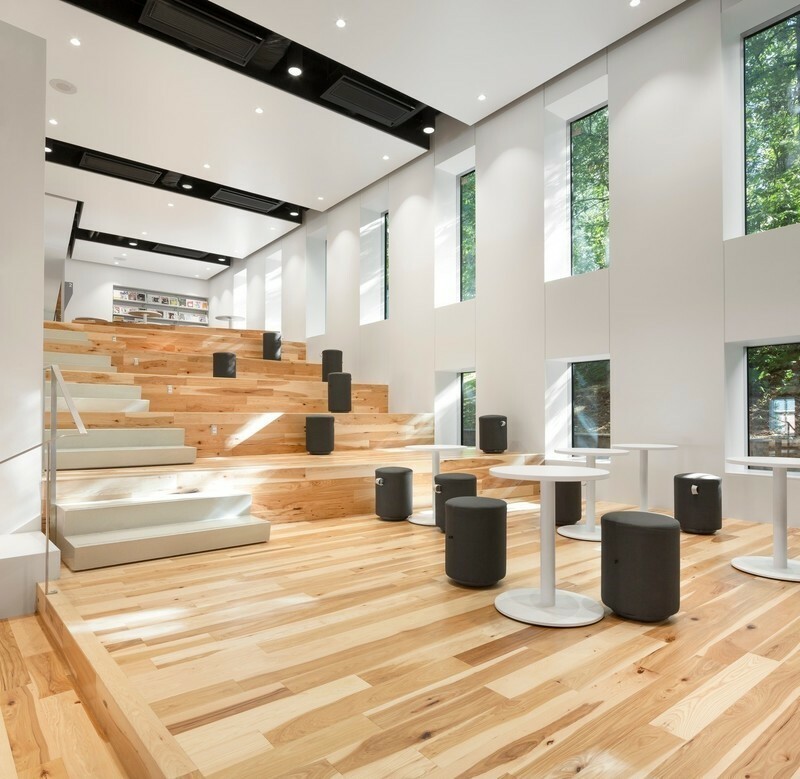 An overhead roof shades the garden and is pulled away from the exterior wall to allow a naturally-ventilating outdoor space, thus keeping the Scholar’s Garden cool. 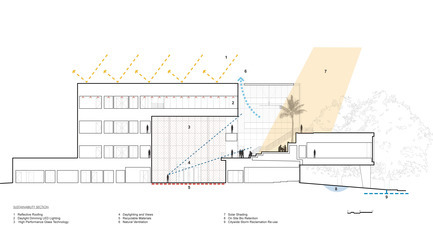 This shaded cool micro-climate courtyard affects the general enclosure of the building and reduces the cooling loads on the facility. gain to minimize the cooling load, thereby reducing energy consumption and carbon by-products. 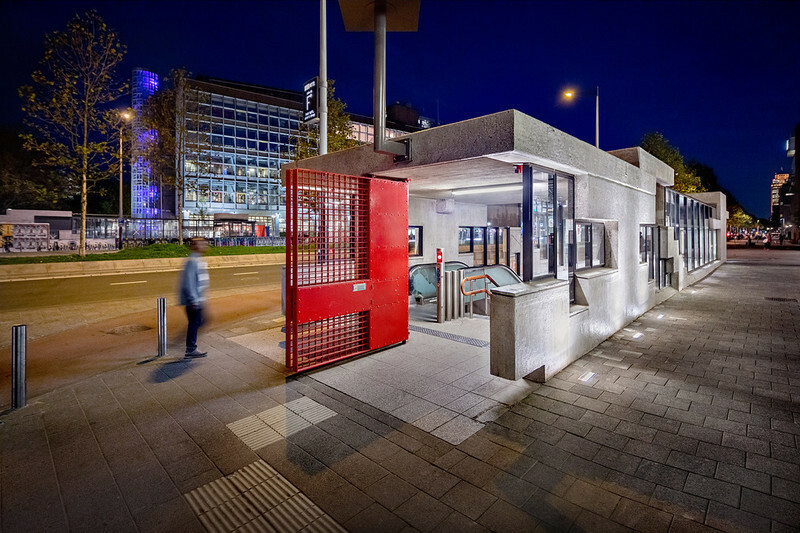 ikon.5 architects achieved that reduction significantly through modern glass technology, and invented a glazing unit that supported the design intent and performed significantly better than standard glazing units. 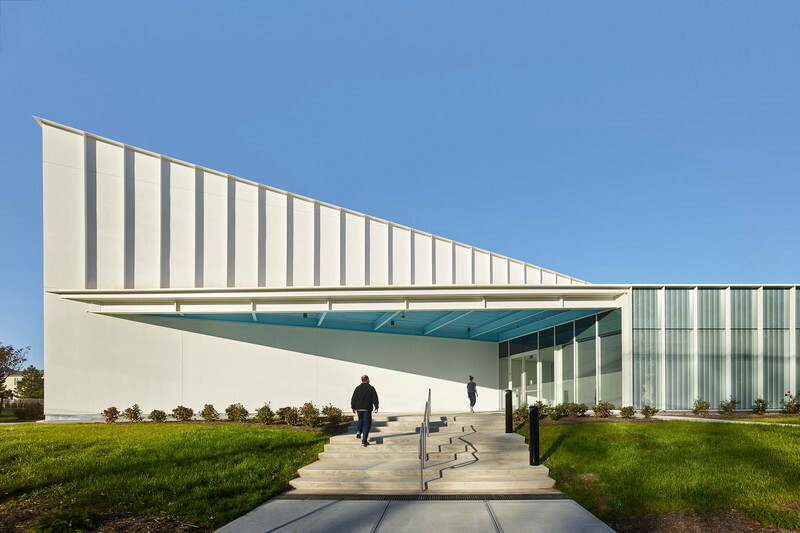 The firm created an insulating unit that reflected 74% of solar gain and provided 26% transparency by applying a ceramic coating on the second surface of the first side and a reflective one-way mirror surface on the third surface of the second side. 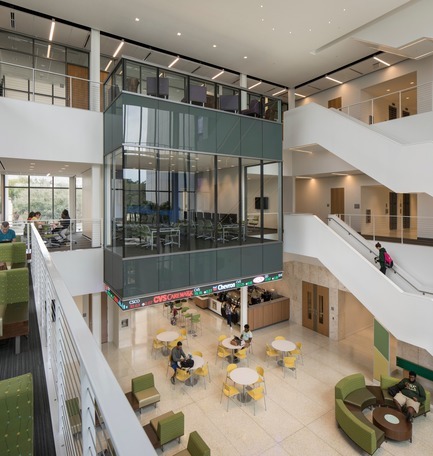 “The LEED Gold awarded to Lynn Pippenger Hall is a testimony to the sustainable design of the building and a reaffirmation of our values and commitment to the environment,” said Sridhar Sundaram, Dean of the Kate Tiedemann College of Business. 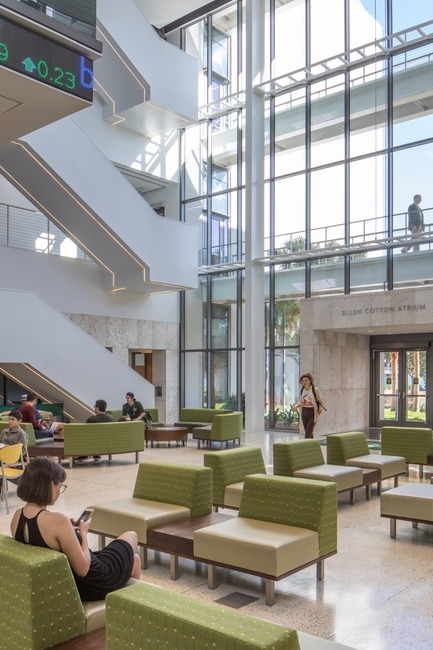 “The work of innovative building projects such as USFSP’s Lynn Pippenger Hall is a fundamental driving force in transforming the way buildings are built, designed and operated,” said Mahesh Ramanujam, president and CEO of the U.S. Green Building Council. 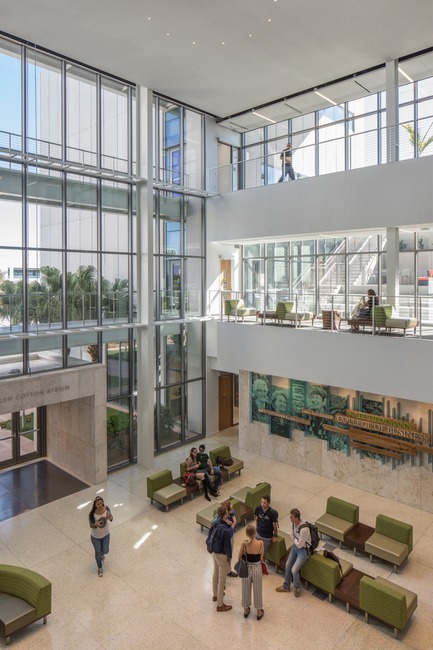 The American Institute of Architects’ Tampa Bay Chapter named Pippenger Hall a 2017 Honor Award winner. 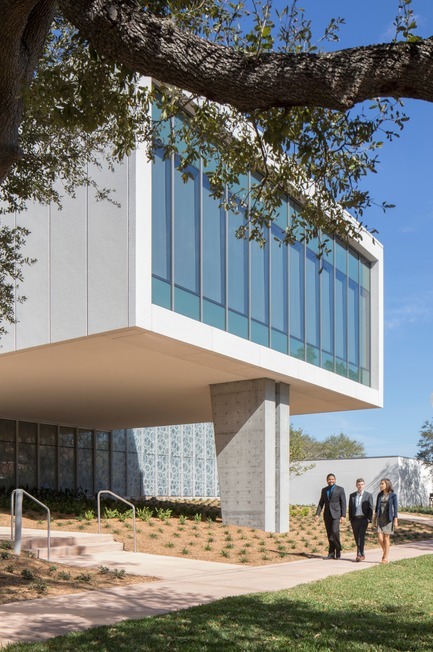 Through their awards program, AIA Tampa Bay honors architects that are committed to improving communities through design excellence, and buildings that demonstrate the highest standards of design and innovation and a commitment to excellence in architectural design. 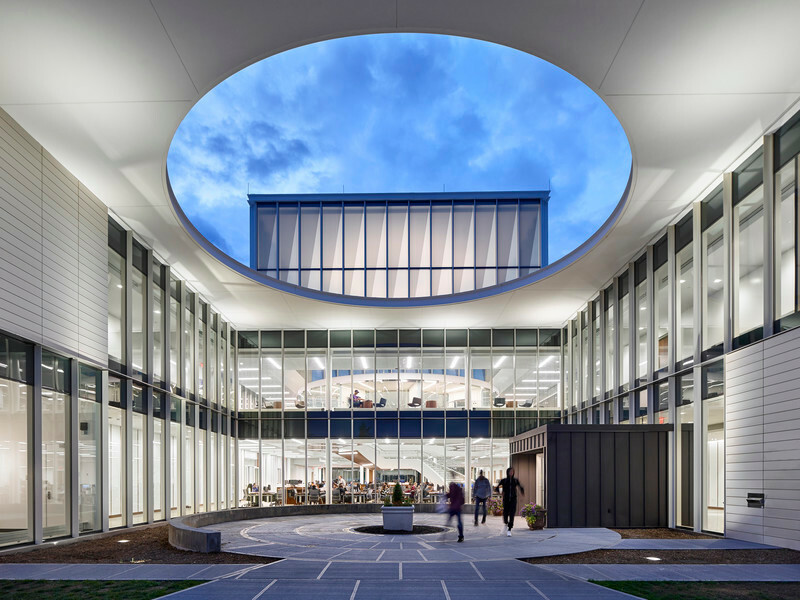 The Architect’s Newspaper’s A|N 2017 Best of Design Awards is a unique project-based awards program that showcases building elements and judges projects on innovation, creative use of new technology, and sustainability and cited Pippenger Hall for honorable mention in its Facades Category. 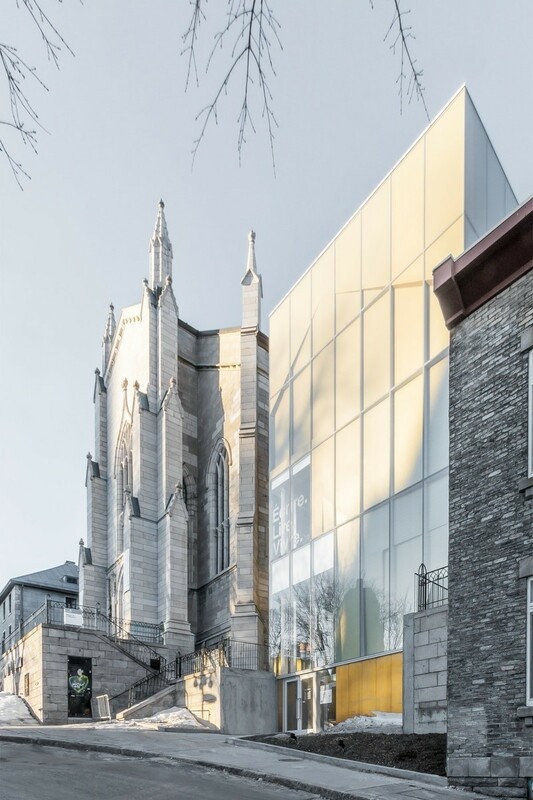 Pippenger Hall was designed by ikon.5 architects / Harvard Jolly Architecture, a joint venture between Harvard Jolly Architecture of St. Petersburg and ikon.5 architects of Princeton, New Jersey. 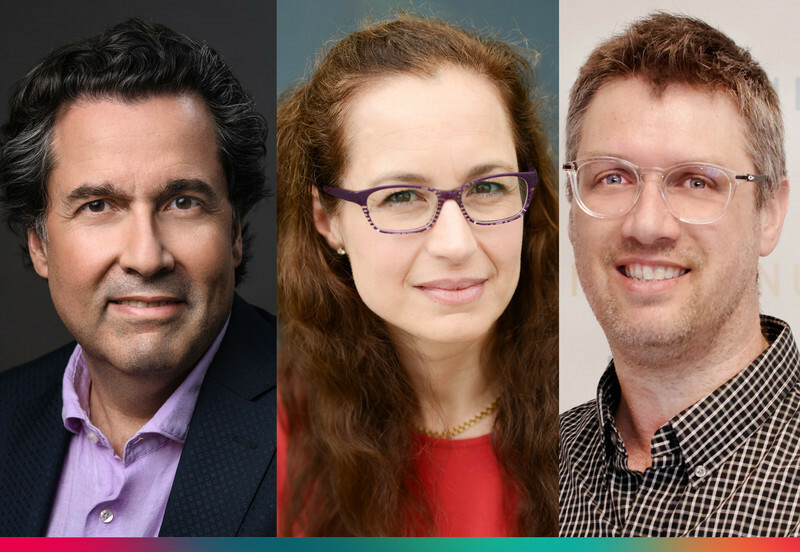 Formed in 2003, ikon.5 architects is a design-focused architectural practice that provides its clients with innovative design solutions that exhibit a high level of craft, are aesthetically refined and carefully detailed, and achieve design excellence. 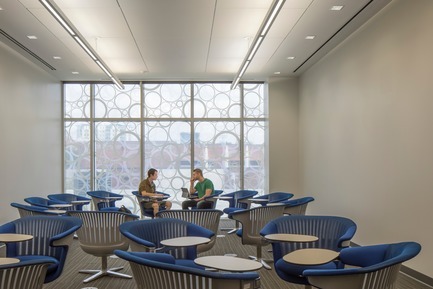 Practicing nationally, the firm’s clients include colleges and universities, non-profit organizations, cultural institutions, governmental bodies, and global corporations. 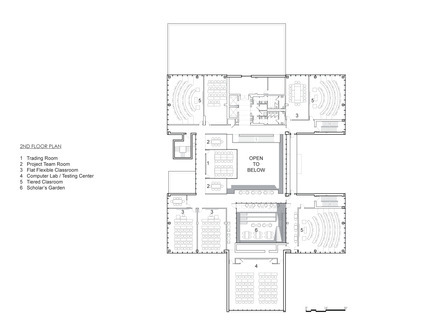 Their collaborative working style, unwavering commitment to design excellence, and exceptional client service has resulted in a high level of return clients (50%) and earned the firm over 100 global design awards, as well as a nomination for a National Design Award by the Cooper Hewitt Museum (2013), and recognition as one of the top ten design firms in the United States by Architect magazine over the last six years. For more information, visit www.ikon5architects.com. 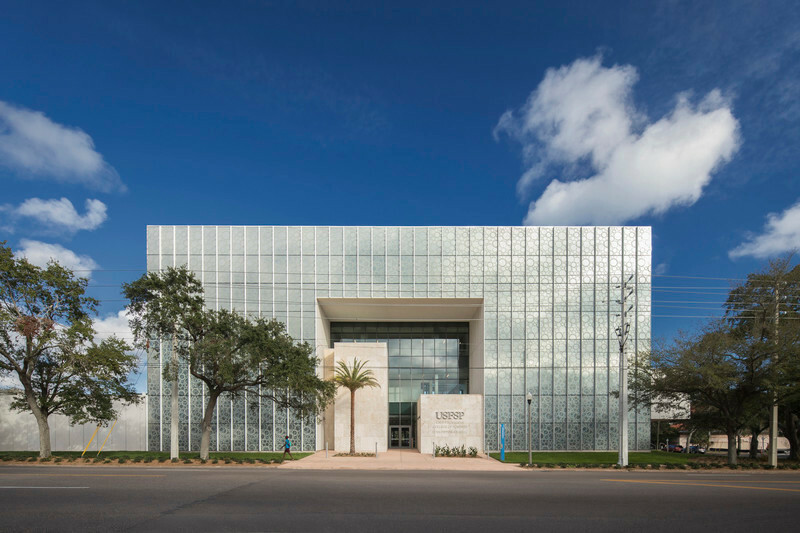 Harvard Jolly Architecture is headquartered in St. Petersburg, Florida.